Various methods and spectra are available – it depends a bit on the size of the protein and the amount of spectrometer time available as to what spectra are used. A straight forward method is to begin with a set of HBHA(CO)ONH, H(CCCO)NNH and CC(CO)NNH spectra. These will provide the hydrogen and carbon side-chain chemical shifts for the residue preceding each NH group. For longer side chains not all peaks may neccessarily be visible, so that this may not be sufficient. In some cases it may also be difficult to distinguish between say an Hβ and an Hγ shift. Furthermore the connectivity of which hydrogen is attached to which carbon is also not provided. This is, for instance, relevant in the case of Valines where there are two methyl groups: it may be possible to identify both methyl carbon and both methyl hydrogen chemical shifts, but it will not be known which is bound to which. The most useful spectrum for side-chain assignment is an HCCH-TOCSY spectrum along with the HCCH-COSY spectrum. The HCCH-TOCSY will at any one carbon position show in one dimension the chemical shift of the hydrogen which is attached to the carbon and in another the other hydrogens belonging to that side chain. There is thus a huge amount of information in this spectrum and for large proteins it may become rather crowded. The HCCH-COSY is similar, except that instead of seeing all hydrogens belonging to a certain side-chain in the third dimension, you only see those which are attached to neighbouring carbon atoms. 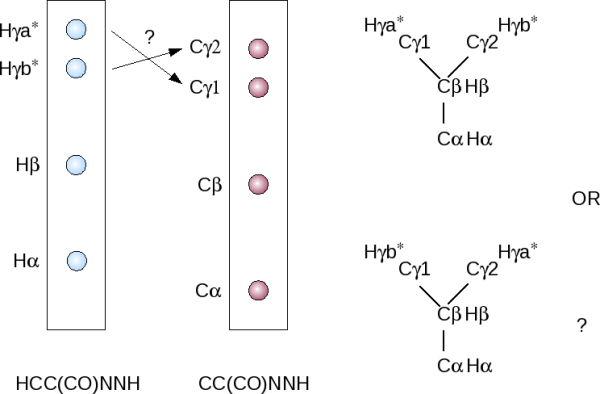 The following figure shows the strips you should be able to see for a Valine residue in the HCCH-TOCSY and HCCH-COSY spectra. 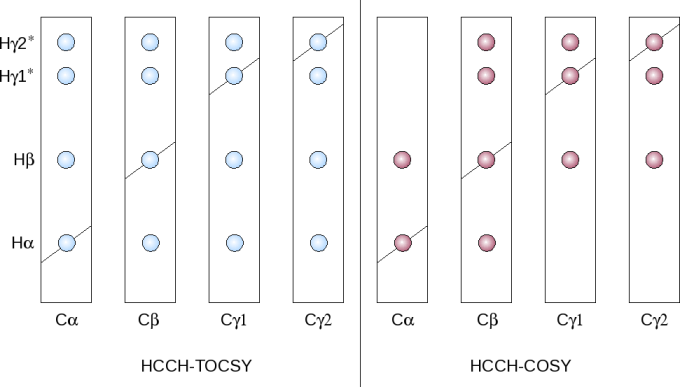 The general principle behind using the HCCH-TOCSY spectrum is as follows: Using your known Cα and Cβ chemical shifts from the backbone assignment, you go to these points in the spectrum. You will then immediately get the Hα and Hβ chemical shifts by finding strips at each carbon shift which have peaks at the same hydrogen ppm values. You should also be able to see further peaks for the Hγ and Hδ atoms (if present in that particular amino acid type). By navigating to these new hydrogen shifts you should in turn be able to identify the shifts of the carbons they are attached to.